The senator went from Massachusetts to New Hampshire on Saturday. 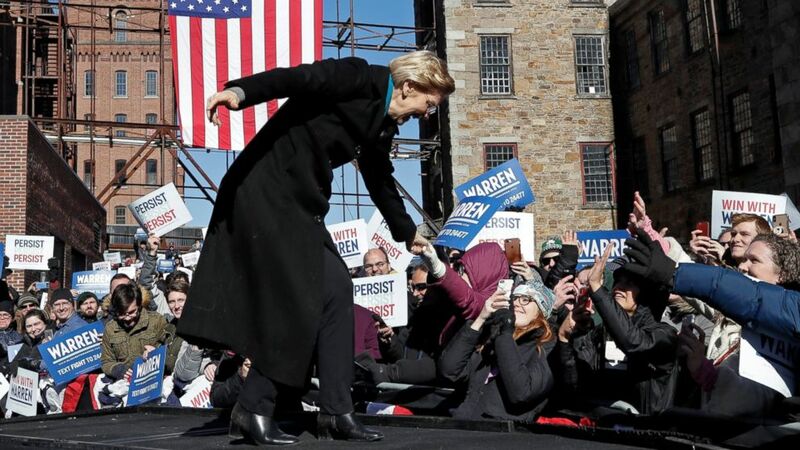 Elizabeth Warren, fresh off her official 2020 announcement, made her debut as a presidential candidate in Dover, New Hampshire, the first-in-the-nation primary state, to pitch radical changes to Washington. The Democratic senator told the story of her childhood as one of perseverance and positioned herself as a champion for the middle class. The organizing event in an auditorium tucked inside Dover City Hall also featured a special guest on stage: her dog Bailey, alongside her entire family. (AP) Sen. Elizabeth Warren, D-Mass., shakes hands with supporters as she takes the stage during an event to formally launch her presidential campaign, Saturday, Feb. 9, 2019, in Lawrence, Mass. Warren also took questions from the audience on a range of issues, including money in politics, veterans, public education, divided government and Israel. She again noted she will not take a “dime” of PAC money and proposed overturning Citizens United, the Supreme Court ruling that allowed corporations to spend unlimited money on political commercials. When posed a question on Israel, she said she supported a two-state solution. And when asked about how to govern in such divisive times, Warren told a story about a bipartisan effort to make hearing aids more affordable for the 40 million people in America who need them. But some of the attendees in the audience weren’t completely sold on Warren. That one thing, Rose said, was the wealth tax. Her stop in New Hampshire, a key state for Warren for her candidacy since it borders her home state of Massachusetts and plays a significant role in electoral politics, comes on the heels of The Washington Post releasing a report that she identified as an “American Indian” on a form for the state bar of Texas in 1986. “My understanding is that in her childhood she was told that’s what her background was and I don’t see anything malicious about it. It’s a non-event,” said Scott DeVow from Wakefield, Massachusetts.